Recently I reviewed Shakra's latest record Back On Track and my conclusion was that quality melodic hard rock never goes out of fashion. Well, I can pull these lines from the shelf yet again since Dangerdog dropped Millions latest release Sane & Insanity on my desk. 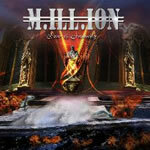 Swedish quintet Million are in the business for more than 20 years and so far they pushed out a decent number of six studio albums with Sane & Insanity being number 7. This is the band's second record for the Metal Heaven label after 2008 Thrill Of The Chase. Before that, Majestic Rock took care of business. If this change was intended to improve their mind position in the rock hemisphere than surely it has failed. That is at least as far as my head is concerned because I mainly recall them for their 1991 debut called No.1. Ever since I have seem to have missed any of the later stuff. But after listening to this newcomer a few times now, I am glad we eventually meet again. Moreover, this album is a pretty good reason to rummage around their back catalogue and start catching up a bit. To continue the comparison with their Swiss colleagues, Sane & Insanity sounds just as big and sharp, although the Swedes put more emphasis on the keyboards than the boys from the Alps. Quality wise that makes zero difference, it's just a different approach with the same result: heavy, resolute, competent and highly entertaining melodic hard rock. Best song is the title track, where new key man Angelo Modaferri shines providing exactly the right electro weight to the song. The track reminds me of good old Axel Rudi Pell, but that should be taken as a compliment because I like this German guitar virtuoso a great deal. Next best is the ballad Fuel To My Heart. Not many tracks will hit the power ballad nail harder than this one. Great harmony vocals, great chorus, strong guitar solo, it's all there. Other highlights include the trio of Test Of Time, Tomorrow Never Dies and closer Seize The Day who all feature a fitting Hammond organ that will make old days Deep Purple fans cry from recognition. Special mention deserves the intro on Test Of Time, I really had to double check if not DP's Made In Japan accidentally ended up in the CD player. Production wise no comments either, the album was recorded in famous Gothenburg's JM Studios under the helm of Martin Kronlund. A solid combination that not only will appeal to most Dangerdog readers, but also gives this record the big sound it deserves. Anyone who enjoyed Treat's Coup The Grace last year and Bad Habit's latest Atmosphere cannot go wrong with Sane & Insanity. In the end I would like to borrow a line from my colleague Craig who recently ended one of his reviews like this: Predictable? Yes. Innovative? No. Prime stuff? Absolutely. Thanks Craig. And Million of course. Anyone who enjoyed Treat's Coup The Grace last year and Bad Habit's latest Atmosphere cannot go wrong with Sane & Insanity.